I've been wanting to see Brandi Carlile since I first heard her music nearly five years ago. On our first trip to Seattle we stayed around the corner from Easy Street Records and every day I had the clerks recommend some local music I should buy. 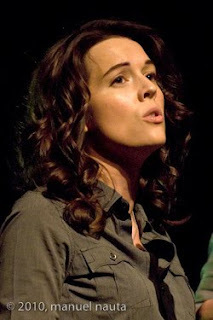 One of the first ones they recommended was Brandi Carlile Live at Neumo's - a Seattle club. I immediately liked it and when she released "The Story" not long after I found her growth as a songwriter to be amazing. That was followed up earlier this year with "Giving up the Ghost". I still haven't decided which of her full albums I like better but you can't lose with either one. Right after the new release her show at Hogg Auditorium on the UT campus was announced so I grabbed some tickets. You may have heard some of her songs on the TV - she is a favorite of "Grey's Anatomy" I have been told. We had never been to Hogg before but it's right around the corner from the Cactus Cafe. We had 12th row tickets and it's a great place to see a show - holds around 1,400 or so and Brandi sold the place out. The place brought back memories of old days as each seat had one of those fold away desks for students to use for writing on - it is on a college campus. After a non-descript opening band played a bunch of slow sad songs Brandi took the stage. She has twin brothers playing bass and lead guitar as well as a guy playing the cello and a drummer. They opened with an acapella version of "Oh Dear" which was a very unique opening. Highlights included "Late Morning Lullaby" which she sang from the edge of the stage with no mike, the new song "Dying Day" and my favorite song of hers, "My Story". A haunting version of Tears for Fears "Mad World" was performed to close the main set with Brandi solo on piano. The Hanseroth twins opened the encore with a nice version of Simon and Garfunkel's "Sounds of Silence" and then Brandi covered Johnny Cash's "Folsom Prison Blues". Brandi closed the show with the great new song "Dreams" and the crowd went home happy after 90 minutes of performances from one of the best new singers out there. If you haven't listened to the "The Story" or "Giving up the Ghost" give them a spin or better yet if she is coming to a town near you grab some tickets. You won't be disappointed!